2014 Virginia State USBC Women’s Championship Tournament Singles/ Doubles event was held at AMF Hilltop in Roanoke and the Team event at Vinton Bowling Center in Vinton, Virginia March 22nd through May 4th, 2014. Our Virginia Peninsula USBC Ladies performed very well placing in the top 5 of several divisions. In the Team A, Classic (604 and Above) Handicap Here 4 the Beer with teammates Brenda Bogucki, Teresa White, Sandra Cunningham and Kathryn Trimarchi placed 3rd rolling a 2919 total just 5 pins out of second place. Team A, Regular (603 and Below), Handicapped found 4 Dolls, Therese Gravely, Julie Lear, Arlene Nucci and Susan Bender just one pin short of 2nd place rolling 2885 for 3rd place in their division. In Team B, Classic (604 & Above), Handicapped, 2nd Place, Feisty Fillies, with teammates Glenda Bryant, Catherine “Rocky” Shaw, Reginia Haynes and Gladys Little, scoring 2896 beating the 3rd place from Nation’s Capital Area USBC by one pin. No Ten Pins competing in the Team B, Regular (603 & Below), Han dicapped with Vicky Schmidt, Noy Zicopula, Kinue Butts, Kame Melendex scoring 2905 took 1st Place in a close one with the 2nd place team 5 pins less with a 2900. Also No Ten Pins teammate Noy Zicopula placed 4th in the Singles A, Classic (151 and Above), Handicapped with a score of 825. Team B, Classic (604 & Above), Handicapped Feisty Fillies, Glenda Bryant,Catherine “Rocky” Shaw, Reginia Haynes and Gladys Little, 2nd Place 2896 beating 3rd place by one pin 2895. Glenda Bryant, also on the Feisty Fillies, tied with Rose McLain from Charlottesville-Albemarle USBC WBA for 1st with 816. Team B, Scratch Girls With Balls 2, Joylene Chappell, Kristana Butz,Sara DiScioscia, Kelly Manahl rolled 2264 came in 1st Place averaging 566 for the team event. Their teammate Sara DiScioscia came in 2nd with a 1855 in the All Events A, Scratch division. 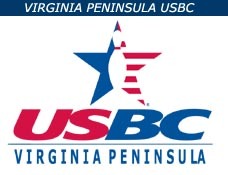 This entry was posted in Tournaments, VPUSBC, VPUSBC NEWS on May 24, 2014 by Virginia Peninsula USBC.